Get classic tube bass tone with modern-day features and reliability. 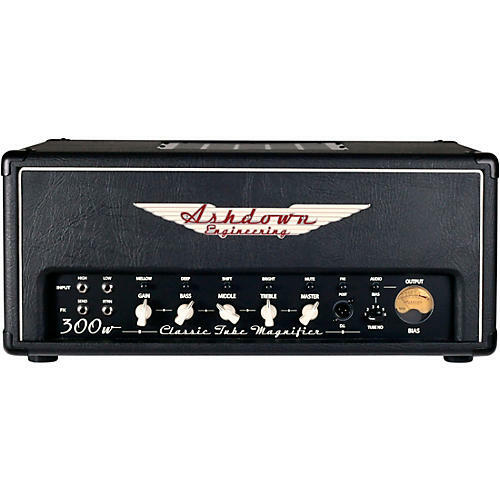 Taking inspiration from the classic tube heads of the past, Ashdown presents the all-tube CTM-300, a 300W valve masterpiece that melds classic tones with modern features, construction and reliability. Handbuilt in the U.K. Ashdown Custom Shop, the CTM 300 head is housed within an 18mm Marine grade birch ply cabinet that features heavy duty flip style handles and an internal fan to keep things cool. This is an amplifier that is built to last using only the finest components to ensure years of trouble-free performance night after night. With a classic five valve preamp configuration and a fully-loaded power section consisting of 6 x KT88 output tubes to provide the huge grunt, warmth and headroom bassists crave, this is a serious bass amplifier to be called into action when only the best will do. From mellow '60s bass tone to growling '70s-style bass, straight through to thick and powerful modern tone, the CTM-300 covers a huge range of sonic ground. Hit the Mellow button to engage smooth, warm, clean tones – or punch it out to dial-in pure valve overdriven growl. Standard tone controls give you a wide range of uber-musical sounds, while Deep, Mid Shift, and Bright switches let you fine-tune your tone to the situation. The EQ section is a passive tone circuit - meaning if all controls are at zero there will be no sound through the amp. All the controls are highly interactive, giving you the possibility to dial in exactly what tone you want. Don’t be scared to dial the pots all the way to get the most from the controls. To get your tone direct to the desk in the studio or on stage, the CTM-300 features a tube-driven, transformer-derived DI output with an isolated ground to deliver maximum sonic purity and consistent output night after night. Similarly, the front-mounted effects loop is also tube-driven for maximum tonal preservation.